Those who follow my blog/Flickr/Facebook know I have a wildly cute puppy. It’s not that his physical looks are so unusual – he’s a fully black mutt. But his charisma is off the charts. His flying skills are marvelous. He adds a new dimension to our family that makes it seem it was impossible he ever wasn’t with us. “What is he?” is a question I try to answer frequently. He’s longish and squatish, but has a face that reminds most people of a lab. I’ve settled on “He’s American.” I usually follow it up by saying we got him at the Broward County Humane Society. 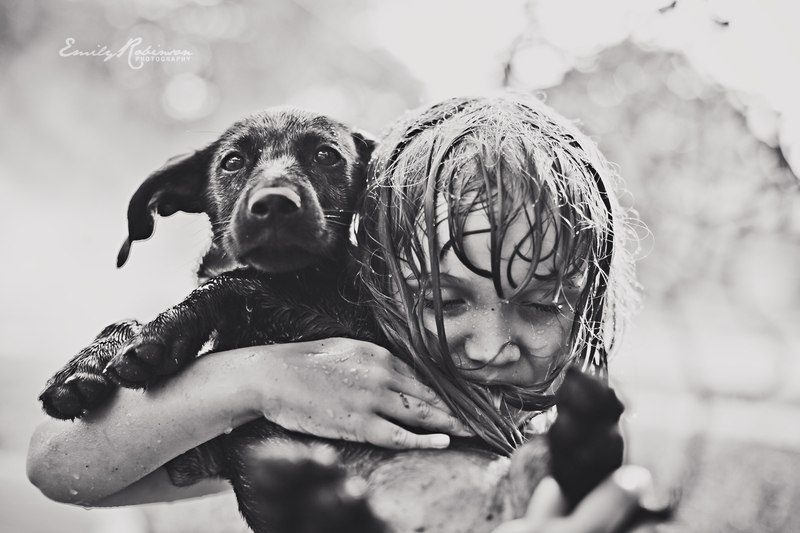 It was tough for me to choose an image for this month’s challenge, but this one of Zoey and Sonny, shortly after they both played in the splash pool, is a definite favorite. Head over to I Heart Faces to see more entries this month in the pet face challenge. Great shot! I love candids! Awww, our puppy came from the Broward County Human Society also!! She looks very similar, and just as sweet. Oh my good heavens. So incredibly adorable. I love, love, LOVE this shot. Congratulatiosn on being a winner this week! Oh my goodness, this is incredible! What post-processing did you use to get that phenomenal creamy black and white?